A number of years ago, I read an interesting report from Bob Ross of Pilgrim Publications in Pasadena, Texas, about his trip to England, where he visited several places of interest having to do with Charles Spurgeon. The photos accompanying the article showed a cold and wet climate that made me wonder if I wanted to make such a trip, but, in spite of that hesitation, I decided to do everything I could to plan a similar trip in the not too distant future. My wife and I thought a trip to London would make a nice fiftieth wedding anniversary celebration, which we planned for 2008. Two tragic events, a fire in our sanctuary and the loss of our only daughter, put almost everything in our personal lives on hold; however, we found the opportunity to do what had been postponed for four years. On October 1, 2012, we arrived in London via nonstop flight from Dallas/Fort Worth Airport to London Heathrow, took a subway to Russell Station and waked to Hotel Russell just around the corner. The weather was pleasant with some rain but mostly at night. We spent a couple of days at the British Museum, watched the changing of the guard at Buckingham palace, marveled at the Parliament buildings, Westminster Abby, the Tower of London and the crown jewels. We took a train to Lewes, England, and toured the castle built in 1068 by one of my ancestors, William de Warenne. The next Monday we took a fast train from London to Paris and got a glimpse of the Eiffel Tower through the haze and made it through only about half of the Louvre. Greatest points of interest were, of course, the Mona Lisa and the code of Hammurabi, founder of the Babylonian Empire. Metropolitan Tabernacle, Sunday, October 7. We took a fifteen minute bus ride from our hotel to the church building. The main floor was completely full when we arrived, but the ushers pointed us to the balcony which quickly filled to capacity. The service began when Pastor Peter Masters came to the platform. He sat and prayed as the organ played the prelude. There was no worship leader, no choir, no "special" music, no performances of any kind. Dr. Masters announced the hymn, the organ began to play, the congregation stood and sang. He prayed. He read the scriptures. A deacon announced the offering, it was received and Dr. Masters prayed again. Then he read from James 1: "My brethren, count it all joy when ye fall into divers temptations; Knowing this, that the trying of your faith worketh patience." It was a message directed straight to my heart. This trip had been delayed for four years due to tribulations that had tried my faith. First, the fire that decimated our sanctuary. Then in the midst of recovery, our only daughter, Julie, our pianist and soloist, my joy in life was taken from us. I had even preached through the Book of James a few months earlier. I had noted that the trials of life are God's means of sanctifying and strengthening us. And that a sovereign God always knows what is best for His children. But when Dr. Masters preached the same text, it was as if I were the only person in the audience. I had traveled 4,800 miles to hear this message. The service ended much as it had begun. A hymn and a prayer. I filled out a visitor's card and handed it to a deacon and we engaged in conversation for several minutes. He asked if I would like to meet the pastor, an offer I seized with great enthusiasm. Dr. Masters graciously took my wife and me into his office, showed us Spurgeon's podium and handwritten sermon notes and three large portraits of three pastors whose tenure had spanned almost two hundred years. Imagine that! Three pastors: John Gill, John Rippon and Charles Spurgeon pastored the church from 1720 to 1892. Lewis Drummond's 1992 biography of Charles Spurgeon is called: Spurgeon Prince of Preachers. The 895 page treatise on the London pastor includes some well-known facts as well as some little-known facts. One such fact is the woeful controversy involving Spurgeon and the Baptist Union. It was sparked in 1887 when Spurgeon printed a series of articles which were critical of liberal theology. The controversy would end after Spurgeon withdrew from the Baptist Union, an organization that he had helped build. He would live five more years in virtual isolation and pass away in 1892 at age 57. 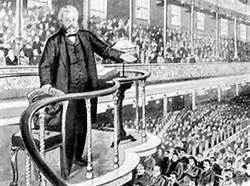 In 1854, Spurgeon went to the New Park Street Baptist Church in London as a supply preacher for six months and never left. He pastored the church for the next 38 years—the rest of his life. 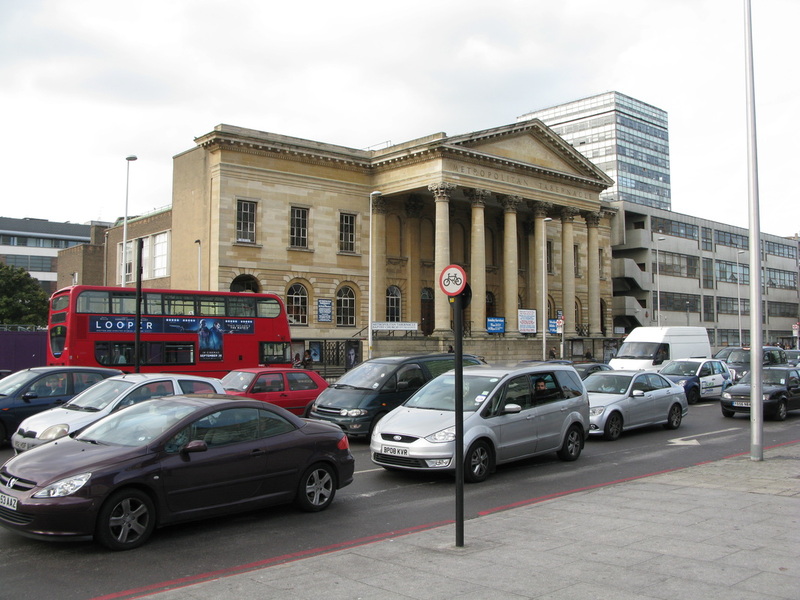 It was renamed Metropolitan Tabernacle in 1861 when the church moved to a new location. The "Down Grade", as Spurgeon called it, was a controversy that developed over several years and erupted in 1887 in Spurgeon's paper, The Sword and the Trowel. He said he feared that the Baptist Union (same as an association or a fellowship in this country) was on a down grade of liberal theology. He said the Parliament had expelled Puritanism from the Church of England in the Act of Uniformity in 1662 and replaced its Calvinistic doctrine with Arminianism giving rise to independent Baptists. Spurgeon's first article (March 1887) said that every single independent Baptist church was established on Calvinistic doctrine but this changed as several books were written to counter the Antinomianism of Tobias Crisp, an eminent preacher. The books frightened a large number of Baptists and put them on the "down grade," Spurgeon contended. We would call it an over-correction. Spurgeon's second article (April 1887) said: "Arminianism, which is only Pelagianism under another name, had, to a large extent, eaten out the life of the Church of England, and Arianism followed to further and complete destruction." In the third article (June 1887) Spurgeon said: "By some means or other, first the ministers, and then the Churches, got on `the down grade,' and in some cases the descent was rapid, and in all, very disastrous. In proportion as the ministers seceded from the old Puritan godliness of life, and the old Calvinistic form of doctrine, they commonly became less earnest and less simple in their preaching, more speculative and less spiritual in the matter of their discourses, and dwelt more on the moral teachings of the New Testament, than on the great central truths of revelation." The article did not attack the independent Baptists, but warned that the same thing could happen to them. To leave Calvinistic doctrine was to enter on a slippery slope into apostasy and disaster. He said: "Those who turned from Calvinism may not have dreamed of denying the proper deity of the Son of God, renouncing faith in his atoning death and justifying righteousness, and denouncing the doctrine of human depravity, the need of Divine renewal, and the necessity for the Holy Spirit's gracious work, in order that men might become new creatures, but dreaming or not dreaming, this result became a reality." Liberalism at Harvard University and Andover Seminary, a Baptist institution, was used as an example of what had happened in America when one gets on that slippery slope. Both of those schools were instituted for the purpose of training ministers but had fallen into doctrinal error. The reaction to these articles was not very radical at first. Spurgeon wrote more articles in August, September and October, 1887, in which he said: "The Atonement is scouted, the inspiration of scripture is derided, the Holy Spirit is degraded into an influence, the punishment of sin is turned into a fiction, and the resurrection into a myth, and yet these enemies of our faith expect us to call them brethren and maintain a confederacy with them." Spurgeon hoped the Baptist Union, meeting that year, would address his concerns set forth in the six articles. He was disappointed. The Union totally ignored his concerns. Some of the young men used the occasion as a joke about an old man's senility. Few followed Spurgeon's warnings. He withdrew from the Baptist Union in a letter dated October 28, 1887. The congregation of the Metropolitan Tabernacle passed a resolution with the following wording: "...the church worshipping at the Metropolitan Tabernacle in annual meeting assembled, desires to express its hearty sympathy with its beloved pastor, C.H. Spurgeon in the testimony for truth he has recently borne by his articles upon `The Down Grade,' endorses his action in withdrawing from the Baptist Union (follows him in the course he has taken) and pledges itself to support him by believing prayer and devoted service in his earnest contention for the faith once for all declined to all the saints." from the faith. Spurgeon refused. The association passed two resolutions: the first one accepted Spurgeon's resignation and the second one became known as the "Vote of Censure." Only five members voted against the measures. In the February 1888 Sword and Trowel, Spurgeon gave his defense. He gave no reason for keeping silent about the identity of those he believed to have departed from the faith and argued that the association had no means by which to expel them if he identified them. It was later learned that those names had been supplied to Spurgeon by the secretary of the association who had sworn him to secrecy. The entire controversy left Spurgeon with few friends and failing health. The great preacher never recanted his Calvinistic convictions. Someone said that God's servants are not called to win every battle, but they are called to stand firmly on the truth. Such a man was Charles Haddon Spurgeon. Spurgeon's last sermon was delivered to the Pastor's College on April 21, 1891. His text was John 16:14: "He shall glorify me: for he shall receive of mine, and shall show it unto you" and called it "He Shall Glorify Me." I suppose there are some persons whose minds naturally incline towards the doctrine of free will; I can only say that mine inclines as naturally towards the Doctrines of Sovereign Grace! God had left me alone, and had not touched me by His Grace what a great sinner I would have been! I would have run to the utmost lengths of sin, and dived into the very depths of evil! Nor would I have stopped at any vice or folly, if God had not restrained me; I feel that I would have been a very king of sinners if God had let me alone. I cannot understand the reason why I am saved except upon the ground that God would have it so. I cannot, if I look ever so earnestly, discover any kind of reason in myself why I should be a partaker of Divine Grace. If I am at this moment with Christ, it is only because Christ Jesus would have His will with me, and that will was that I should be with Him where He is, and should share His Glory. I can put the crown nowhere but upon the head of Him whose mighty Grace has saved me from going down into the pit of Hell! Well can I remember the manner in which I learned the Doctrines of Grace in a single instant. Born, as all of us are by nature, an Arminian, I still believed the old things I had heard continually from the pulpit, and did not see the Grace of God. When I was coming to Christ, I thought I was doing it all myself, and though I sought the Lord earnestly, I had no idea the Lord was seeking me. I do not think the young convert is at first aware of this. I can recall the very day and hour when first I received those Truths in my own soul—when they were, as John Bunyan says, burnt into my heart as with a hot iron, and I can recollect how I felt that I had grown all of a sudden from a babe into a man—that I had made progress in Scriptural knowledge through having found, once and for all, the clue to the Truth of God. One week night, when I was sitting in the House of God, I was not thinking much about the preacher’s sermon, for I did not believe it. Editor - How many of us, the number must be tremendous, have had the same experience as Charles Spurgeon. We heard the good pastor preaching as best as he could about God's love for us and Christ dying for us, but he kept ignoring the great truths of Romans 8 and Ephesians 1. How many of us struggled for so long to justify so many of these passages with a free-will doctrine, but we could not. Suddenly, one day, God opened our understanding, and there it was, so plainly explained that God has a particular people, the bride of Christ, His chosen seed. And the Bible for the first time made sense. Praise God for His wonderful Word of Truth. How it feeds the soul with joy and peace. Does God's election seem ? Are some to speak or hear ? A point so little known ? ​MUTABILITY is one of the Divine perfections which is not sufficiently pondered. It is one of the excellencies of the Creator which distinguishes Him from all His creatures. God is perpetually the same: subject to no change in His being, attributes, or determinations. Therefore God is compared to a rock (Deut 32:4, etc.) which remains immovable, when the entire ocean surrounding it is continually in a fluctuating state; even so, though all creatures are subject to change, God is immutable. Because God has no beginning and no ending, He can know no change. He is everlastingly "the Father of lights, with whom is no variableness, neither shadow of turning" (Jam 1:17). The name Reformed Baptist (or Sovereign Grace Baptist) does not refer to a distinct denomination but instead is a description of the church's theological leaning. Not all churches that are reformed in doctrine identify themselves as such. There are two associations of Reformed Baptist churches in the United States: the Association of Reformed Baptist Churches of America (mostly Southern Baptists), which began in 1997, and the Fellowship of Independent Reformed Evangelicals, organized in 2000. There are also many associations and churches in other countries. Metropolitan Tabernacle (Spurgeon's church) in London considers itself a Reformed Baptist Church. Reformed Baptist churches quite often adhere to either the First or Second London Baptist Confession of Faith of 1644 and 1689 respectively. These two statements are usually not considered exhaustive or completely infallible, but instead are convenient summaries of a church's belief. Reformed Baptists attempt to derive all of their doctrine directly from the Bible, which they see as the sole authority of faith and practice. Reformed Baptist churches are distinct in that they are both reformed (adhering to and showing respect for much of the theology defined by the Council at Dort in 1618) as well as Baptists (believing in baptism for believers only, and that by immersion). Historically, the five points of Calvinism have been central tenets of the reformed faith, which all reformed Baptist churches agree with by definition. However, conservative reformed theology is normally committed to covenant theology, one application of which is to justify the practice of infant baptism. For this reason more traditional reformed branches of Christianity (Presbyterian, etc) sometimes refuse to accept their reformed Baptist brothers as truly reformed. Nevertheless, reformed Baptists are distinctly covenantal in their theology, regarding the covenant of grace as made only with the elect. Baptism is seen as a sign of the new covenant administration - made with those who have been regenerated by having the law written on their hearts, their sins forgiven and who savingly know the Lord (Jeremiah 31:31-34). Only those who can credibly profess this reality are to be baptized. Modern reformed Baptists usually consider themselves the spiritual heirs of English Baptists, such as: Charles Spurgeon. The theology of the reformed Baptist is akin to if not descended directly from that of early English Particular Baptists. The centrality of the Word of God: the church takes no part in human schemes for church growth, nor searches for popularity, but sows the Word and trusts God will make it multiply. Historical creeds are considered useful but not a final authority. Regulative principle of worship: the belief that "the acceptable way of Worshipping the true God, is instituted by himself; and so limited by his own revealed will, that he may not be Worshipped according to the imaginations, and devices of Men, or the suggestions of Satan, under any visible representations, or any other way, not prescribed in the Holy Scriptures," (from chapter 22, paragraph 1 of the 1689 London Baptist Confession of Faith). This is usually manifested in a relatively simple worship. Covenant Theology: most hold to the classic Reformed contrast between the Covenant of Works in Adam and the Covenant of Grace in Christ (the last Adam) - and the Elect in Him as His seed. This eternal Covenant of Grace is progressively revealed through the historic Biblical covenants. Localism: each congregation is a fully independent church, which considers itself accountable directly to Jesus Christ rather than intermediately through an earthly organization such as a Convention, Synod or Presbytery. Plurality in Leadership: each local church has multiple Elders or Pastors (also known as plurality of elders); often the terms are interchangeable or denote only a difference in full or partial-time dedication to the ministry. Often all the leaders are called elders, with the pastor being considered only a primus inter pares. The reservation of the Elder role for men, and usually also that of Deacon. Moderate Cessationism: the supernatural Gifts of the Holy Spirit in general, and Revivals specifically, are considered exceptional measures sovereignly bestowed by God, not to be searched as a common policy. Thus a rejection of Revivalism in general and Pentecostalism specifically. The idea of the Sunday as the Sabbath. In the early 17th century, Baptists in England developed along two different theologies. The General Baptists were so-called because they held the General Atonement. The General view of the atonement is that Christ in His death undertook to make possible the salvation of all men who would believe. This position is identified with Arminianism. Early General Baptist leaders included John Smyth and Thomas Helwys. The Particular Baptists were so-called because they held the Particular Atonement. The Particular view of the atonement is that Christ in His death undertook to save particular individuals, usually referred to as the elect. This position is often identified with Calvinism. Some early Particular Baptist leaders included Benjamin Keach, Hanserd Knollys, William Kiffin, and Isaac Backus. Present day Strict Baptists of England are descendants of the Particular Baptists. Sometimes they are referred to as "Strict and Particular" Baptists. The terminology "strict" refers to the strict or closed position they held on membership and communion. The majority of early Particular Baptists rejected open membership and open communion. One notable exception was the author of Pilgrim's Progress, John Bunyan. Over the 18th century, General Baptists lapsed into theological liberalism and practically disappeared from the scene in England. During this same period, the Particular Baptists moved toward extreme dotrinal conservatism, which some have described as Hyper-Calvinism and Antinomianism.